With the papyrus. From left, Rev. Andrew Kadel; Patrick Cates; Dr. Lied; Mary Robison. Our friend, Dr. Liv Engeborg Lied, Associate Professor of Religious Studies at the Norwegian School of Theology in Oslo, has us all excited about her new blog! Dr. Lied is an expert on the ancient Jewish document called 2 Baruch and was excited to see Pap. Oxyrhynchus 403, a fourth-century CE papyrus housed in the Keller Library’s Rare Books and Manuscripts collection. The fragment was published by Bernard Grenfell and Arthur Hunt in 1903, but it has generally received far too little attention in scholarship. I am pretty sure that you have never seen this fragment before, and if you happen to have seen it reproduced in Grenfell and Hunt’s edition, you still have not seen the verso page: their list of plates shows only the recto. 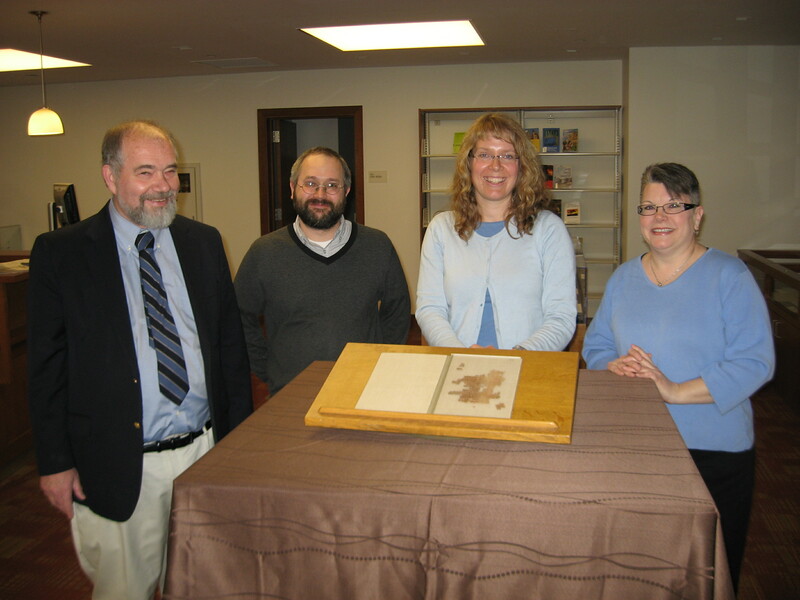 In April I spent a wonderful week in the Christoph Keller, Jr. Library at the General Theological Seminary in New York studying this fragment. With the generous help of the library staff and in the friendly atmosphere of the library I had the opportunity to have a really good look at it. People from all over the world come to Chelsea Square to do research using our Special Collections materials. Just this past year, researchers from the United Kingdom, Haiti, Spain and Hong Kong made scholarly discoveries using our holdings. Our students are encouraged to use these rare materials in their work, too. One of the most rewarding experiences a special collections librarian and archivist can have is to witness the astonishment and joyful exclamations when a researcher makes that great find…we are fortunate at the Keller Library that we have this experience often! Would you like to do research using Keller Library materials? Find out more about our Special Collections and how to gain access to our Library here.